Finally, this fascinating subject is explored in detail. It shows six steps in human evolution. It begins with Australopithecus africanus of 3.68 million years ago, then progresses through Paranthropus robustus, Homo habilis, H. erectus, H. neanderthalensis and, finally, to anatomically modern man, Homo sapiens, of 30,000 years ago. Each of the main sections explores a single species. A highly detailed illustration provides insights into anatomical features, lifestyles and culture. Each is accompanied by a caption summarizing our knowledge. It is followed by line drawings of the tools produced by each culture and a globe showing where they lived. 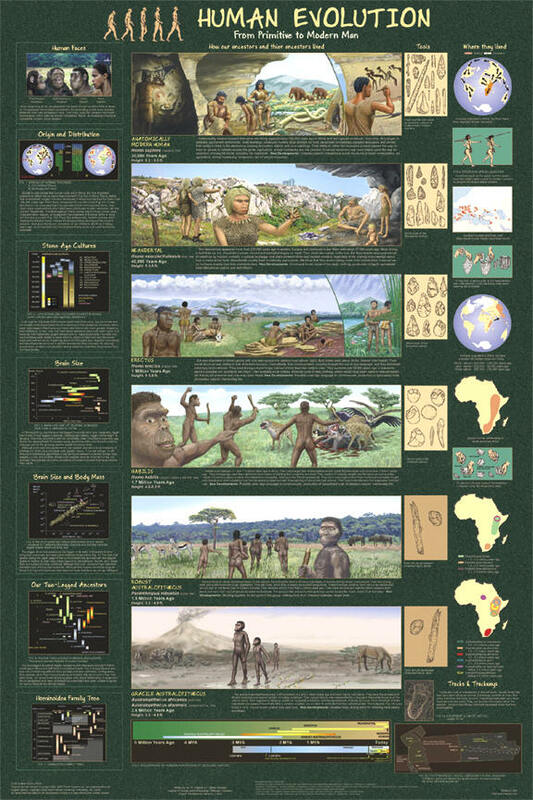 An abundance of additional information is presented through 17 insets that cover a broad range of topics, such as tool-making techniques, the relationship of brain size to body mass, time charts, migration patterns, cladograms, relationship to other species and much, much more.